Wednesday March 9th marked the beginning of a visit to two Nissan plants, exactly two days before the earthquake struck Japan. Our Japan Lean Tour participants considered this day to be the "highlight", with many people giving thumbs-up to the amazing tour of the two Nissan factories. The visit included the Nissan Oppama factory where vehicles are built, and the Nissan Yokohama factory where the engines are built. We were excited to see the engines of the legendary Nissan GT-R being hand-built at the site. 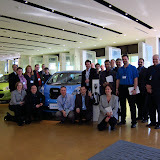 We were also blessed to have the chance to get a ride in Nissan's new all-electric car, Leaf. It was a nice surprise and Nissan folks took the time to give each and everyone of us a chance to get a ride. We were so impressed with the hospitality of Nissan members that some people said that they are going to trade-in their vehicles for a Nissan when they return to their home country! In the evening, we had a very special Japanese dinner at a restaurant called "En", with great views of Tokyo. People were a bit puzzled by some of the food but they were extremely impressed by the overall quality and the authentic "Japanese setting" of the restaurant.